The Podium Programme is designed to produce players that are capable of adding value to the Senior Men’s HKSI Sevens Programme, enabling Hong Kong to compete in major global competitions such as the Olympic & Asian Games. Individual players are required to hit both the initial selection criteria and continual on and off pitch performance and behavioural indicators. Players in the programme range from 15-18 years of age. 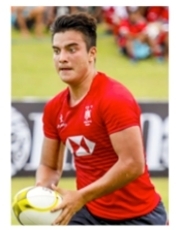 Players are continually challenged in order to prepare them for life as a professional Sevens player. This includes immersion in different environments, such as training alongside the Senior Men’s squad, in addition to a number of training camps and tournaments. A coordinated approach involving the family unit, club, school and HKRU Performance staff is undertaken to ensure player’s schedules are managed. Throughout the year, players rub shoulders with industry experts as they learn the importance of living an Elite Athlete Lifestyle. Areas of focus include; Planning for success, Education and career, Performance behaviours, Lifestyle and resilience, Nutrition, Recovery for performance, and Individual warm-up. The integration and implementation of these areas, alongside regular on-pitch training and strength & conditioning has already seen players progress into the Senior HKSI Programme.